On July 30, 1970, Louis Zemel, the owner of Powder Ridge Ski Area in Middlefield had to tell a crowd of thousands that the scheduled three-day rock festival they had come for was canceled. 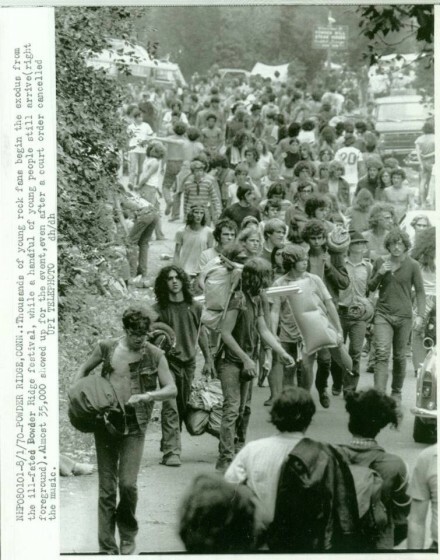 Less than a year after Woodstock, an estimated 30,000 people had showed up for the July 31 through August 2 event, advertised as “A Natural Amphitheatre on Ski Slopes,” which was to feature everyone from Sly & the Family Stone, Fleetwood Mac, Joe Cocker, and Van Morrison to Jethro Tull, Janis Joplin, and Grand Funk Railroad. The youth of America started showing up a week ahead of time to camp on the slopes and complaints from area residents prompted Middletown Superior Court to order an injunction that prohibited the 30 advertised artists from performing. Many of those who arrived stayed in protest even though the state police had set up barricades on roads leading to Powder Ridge up to two miles away and utilities and other services had been cut.